Hehe, that is a reasonable response I'd say! I am amused by Elfy living in the future, it sounds much nicer than the present! Also mine's a Dark and Stormy, please and thank you. I'll have a sweet tea, thank you. What!? You don't know how to make that? Crazy brits with sugarless tea. "Attention! Biscuits still exist tomorrow! That is all - oh, and there's some storms somewhere, homes destroyed and whatnot, but biscuits!" And Chill why does your t-shirt say "Guns don't kill people" on the front and "I do!" on the back? Ah, I now have a goal. Just for those not part of the Commonwealth who are wondering what the fluff Noona and I are talking about biscuits are cookies. Oh, yes, thanks for clarifying Elfy! I forgot. Night all! Enjoy the Tavern-ing. Who gave Jian a beer? Ummm... half the country here in the US has sugarless tea, Chill. And someplaces *brace yourself* it's not iced! It's served hot! You put him behind the bar! Because I like power and can't see my back. And Arry, blasphemy! You don't know what a good drink is. 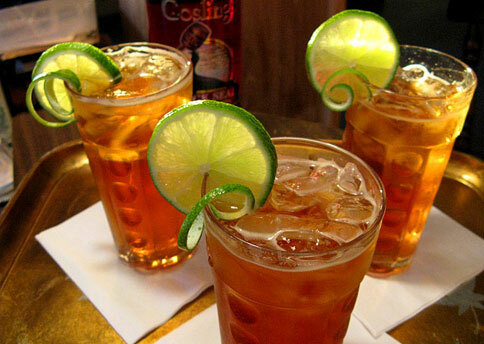 One round of dark and stormy for everyone! On that note, cheers to the_hound for bringing out the dark and stormies!